The Climbing Wall provides great options for kids and young adults to learn climbing in a safe and supportive atmosphere. This on-going drop-off program allows 6-15 year olds access to our top roping area with no parental commitment. All climbing will be done under supervision of our experienced staff as they assist with learning basic climbing skills. Kids and teens ages 6 to 15 will receive instruction from one of our instructors in a class focused on teaching elementary and intermediate skills. Kids and teens ages 6 and up are welcome to climb in our Bouldering Area anytime during open hours. Anyone 6 to 12 years old must be supervised by an adult at all times while climbing in this area. A waiver must be completed by parent or legal guardian. 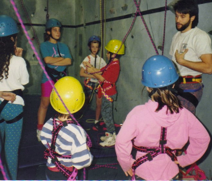 Youth ages 6-15 can climb in the Top-roping Area anytime during operational hours while under the supervision of someone who is Belay Certified at TCW. Teens ages 16+ can participate in the Safety and Belay Course to use this area. A waiver must be completed by parent or legal guardian. The Climbing Wall offers birthday party pacakages as well as several group options for scout troops, youth groups, school functions, etc.